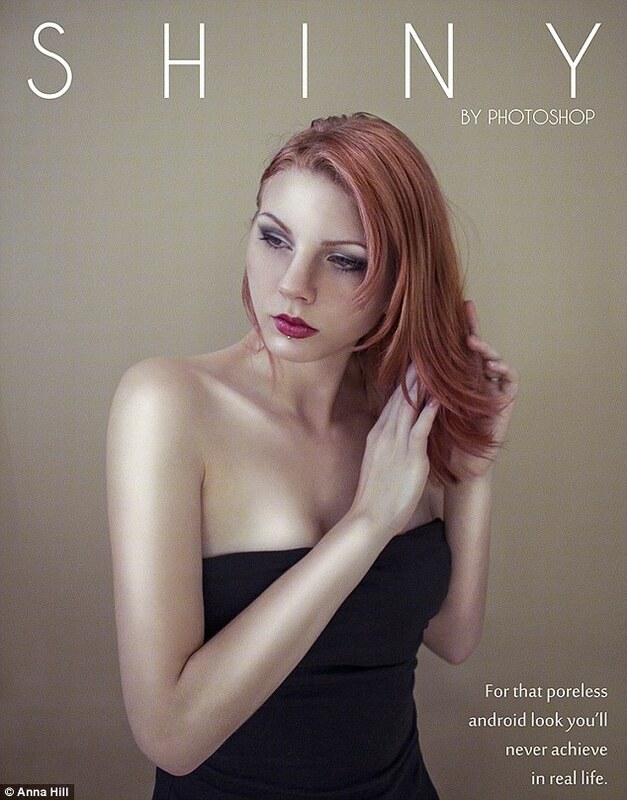 To prove how deceptive altered fashion and beauty images can be, one photography student decided to create her own Photoshop campaign. 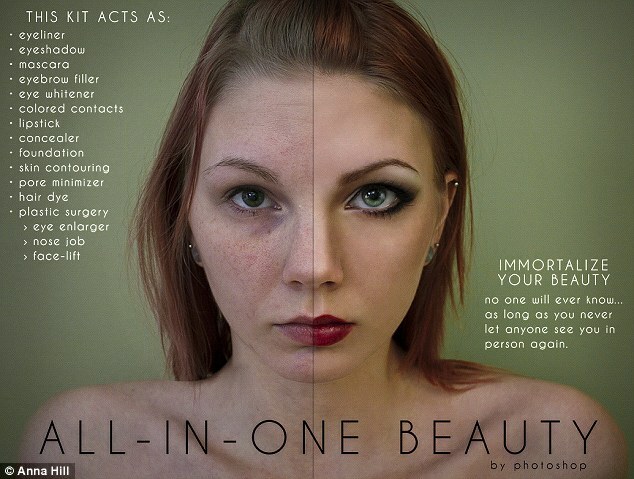 Anna Hill, a student at East Carolina University, created four self-portrait images for her final project Beauty Is Only Pixel Deep; and the mock ads show just how far digital editing can go. ‘I thought it would be fun to poke fun at how much beauty ads are overly manipulated,’ the 24-year-old told the Huffington Post. ‘They really are altered so much, they may as well be advertising Photoshop rather than the products they actually sell,’ she added. 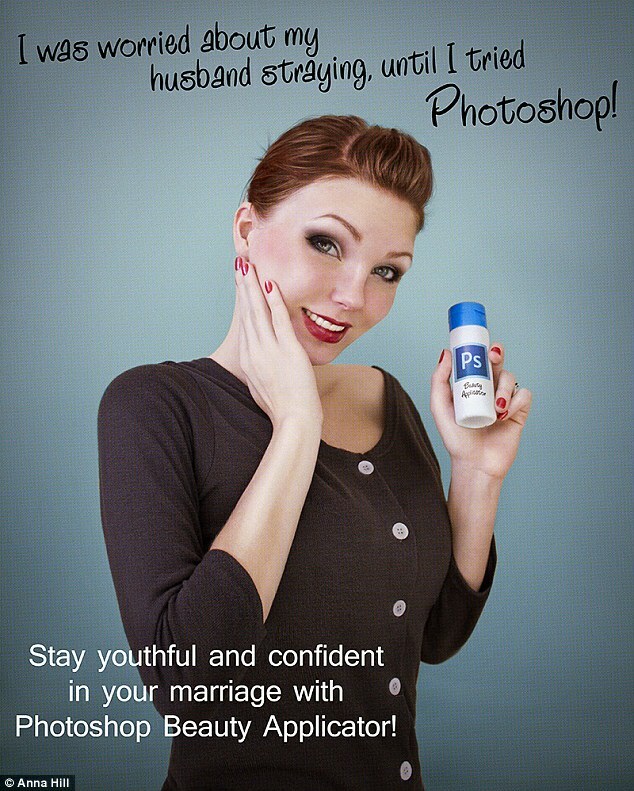 Indeed, the student turns this idea around and states that the Photoshop ‘kit’ she is advertising acts as an ‘eyeliner, eyeshadow, face-lift, concealer and lipstick’. Miss Hill, who taught herself how to use Photoshop at age 14 and says her eye is now trained ‘to see exactly where models have been altered,’ first shared her images on Reddit and admits that the response has been overwhelming. ‘I think people like to be reminded that the beautiful models we’re surrounded by daily aren’t actually as real as they seem – without extensive makeup and editing, many don’t look that much better than the rest of us,’ she told Yahoo!. But even Miss Hill, someone who is actively aware of the role airbrushing plays in advertising, confesses how easy it is to see the altered images as more ‘real’ than the originals. ‘One thing I noticed when I was doing these that when I suddenly went back to the unedited [image], it looked so wrong and kinda gross,’ she said. Inspiration for Miss Hill’s images first came from mascara advertising campaigns. ‘Mascara ads always promise women lashes that are 50 percent longer, but most companies don’t actually use their product in their own advertising; they digitally enhance the models’ eyelashes,’ she said. ‘I applied that idea to a limb-lengthening serum that promised 50 percent longer legs.